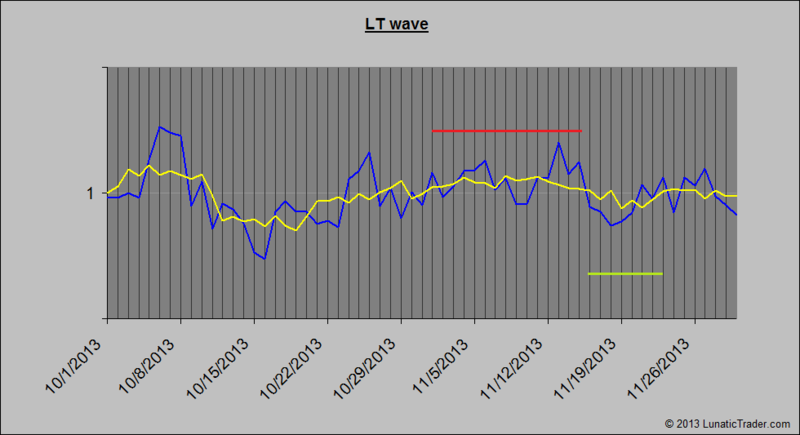 Last month the LT wave didn’t work. The S&P 500 actually bottomed on October 9th and then rose to new record highs, exactly the opposite of what the chart projected. For November we see a slightly positive bias until the 14th followed by a brief period of weakness in the week surrounding the 19th. So, let’s see if the normal cycles return. This entry was posted on November 1, 2013 at 9:15 am	and is filed under Financial Astrology, Market Commentary. Tagged: LT wave, S&P 500. You can follow any responses to this entry through the RSS 2.0 feed. You can leave a response, or trackback from your own site.